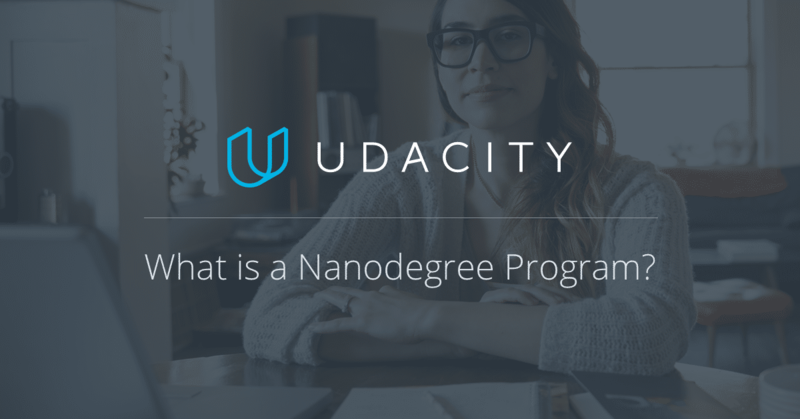 Nanodegree 101: What is a Nanodegree program? What is a Nanodegree program? In this post, we’ll try to answer this question by looking at what it means to offer a skills-based approach. We’ll then highlight some important program details, including our hiring and curriculum partnerships. We’ll follow that by breaking down four key ways a Nanodegree program is uniquely valuable, and then presenting some use cases organized around experience levels. Finally, we’ll explore the distinction between tech skills, and being “in tech,” and show you why the skills you learn in a Nanodegree program are applicable across a wide array of exciting fields. To begin, a Nanodegree program is a credential program. In simplest form, you enroll, you meet a series of expectations, and you receive a credential affirming your successful completion of the program. More specifically, a Nanodegree program is a project and skills-based educational credential program. You enroll, you learn a suite of skills, you successfully complete a certain amount of projects that demonstrate your mastery of these skills, and you receive a credential affirming your mastery of these skills. Learning in a Nanodegree program takes place primarily online, so it can be said that a Nanodegree is an online learning credential program. Our Nanodegree programs are built with, and valued by, industry leaders like Google, Facebook, AT&T, Salesforce, GitHub, and more. Our hiring and curriculum partnerships are unique in the field, and represent one of the key benefits our students enjoy. Only at Udacity, for example, can aspiring Machine Learning Engineers learn directly from Google’s Deep Learning experts. We offer beginner-to-career-track programs in everything from Android and iOS development, and Data Science and Web Development, to Machine Learning and Deep Learning, and Digital Marketing and Business Analytics. We offer programs in cutting-edge emerging technologies like Virtual Reality, Self-Driving Cars, and Robotics. Our students benefit from an unrivaled project review system that produces in-depth, detailed, expert project review at lightning speeds. Virtually all companies prioritize around capability. The importance placed on culture fit generally varies company to company. The importance placed on skills generally does not. You need skills to begin, to advance, and to succeed. This is why at heart our focus is on demonstrable skills mastery. The importance of community cannot be overstated when it comes to career success. Your engagement with, and membership in, communities related to your chosen field will inform the entire lifecycle of your career. Every step of a Nanodegree program is taken in the company of supportive community members. As the penultimate affirmation of your achievement, your Nanodegree credential has intrinsic value. It is proof of your success. However, when it comes to your career, your credential is only as valuable as the opportunities it affords you. This is why our hiring partnerships, and our Career Support team, are such critical components of our model. Companies are now hiring our graduates without even requiring interviews! This is but one clear example of the value placed on Nanodegrees by industry. Our President and Co-founder Sebastian Thrun has often stated his belief that the ultimate value proposition of education is employment. We believe that if you choose Udacity as your learning partner, and your goal is career advancement, then job success is the final barometer of whether we’ve met our obligations to your future. We do everything in our power to see that you land your dream job after you graduate. You have little to no programming skills, you do not consider yourself to be a “techie,” but you feel that to compete in today’s hiring landscape, you need to equip yourself with more modern skills. You’re not thinking career path yet, but you want to emerge from your first Nanodegree qualified to choose a career path. You’re functionally adept with valuable technical skills, but you’re not yet where you want to be in your career. You may be trying to land your first role in your chosen field. You may be attempting a lateral promotion into a position with the kind of opportunity you’re seeking down the road. You may be instigating a career change. You may be re-entering the workforce after a period away. In all these instances, you need to refresh or upskill to achieve your goals. You’re ready to make the leap from fully skilled, to incredibly valuable. You want to master the most cutting-edge skills, compete for top roles at the most innovative companies, and start delivering real value on Day One. You want to learn the skills and techniques used by the most advanced technology companies in the world. Companies that have web properties which must be built, maintained, upgraded. Companies that need to build, maintain, and upgrade their apps. Companies that produce data which must be analyzed, and rendered strategically actionable. Companies which need to automate portions of their operations through the use of sophisticated algorithms that can be trained to increase efficacy. The ultimate goal of a Nanodegree program is to teach the skills you need, for the career you want, so you can build the life you deserve. ← Swift 3: The Great Migration! Augmented / Virtual reality and self driving cars are the only 2 of my passions in life! Thanks for bringing them both, in the form of nanodegrees. How much will they cost, by the way? What I don’t don’t get are the nanodegree programs deep or shallow? For instance if somebody learns a coding skill and learns what the approximate underlying representation on the machine and what its performance implications are then he’s learned a deep skill. In particular for something like deep learning does a person learn about the internal algorithms and their justifications so they can participate in growing the basic technology or do they simply learn a bag of complex tricks to use in the application of deep learning. I noticed that under the section of Value and sub-section Employment, that a Nano degree Plus was mentioned but I’m having are hard time finding any actual info on it. Is this something not being offered anymore or am I reading something wrong? This was very informative and gets me excited about the nano degree as well. Technology is vast, dynamic, and always changing. With this nano degree, it offers the skill set to take great ideas and turn them into a reality. If you pair web development with any specialized field, you could contribute products and services that could make a large impact on consumers. Coding and computer science are essential because younger generations are relying and thriving on technology for most of their needs. The convenience and networking that exists because of technology is now a major factor in how our society thrives. Every business now a days requires a website opening up the demands for excellent web developers. There is a large market for this field of work. The nano degree can open up so many business opportunities and would definitely look great on any resume. Thank you for posting all of this information. It was definitely a good read.